When we hear about a messaging platform failing, like Gmail or Facebook, usually service is affected for a small percentage of users, but today was one of the bigger outages we've seen in a long time. 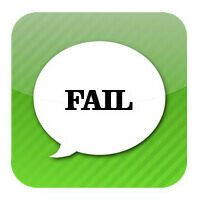 Apple's iMessage service went down this afternoon for about 45 minutes, and the outage affected about 30% of users. Apple's official Services, Stores, and iCloud indicator showed that service was out for "some users" from around 12:30PM-1:15PM Pacific Standard Time (PST), but various reports said that problems persisted until as late as around 3PM PST, and the "some users" that were affected is said to be around 30% of iMessage users, which is a substantial number. There's no word on what caused the problem, but we'll let you know if Apple releases a statement. iMessage seems to be iNotreadyforprimetime. How dare something have an outage. Not like it's never happened before. Think whatsapp, cut the crap. Well said, it's no biggie, but fanboys won't let it rest. Oh please, get off your self-righteous High Apple Horse, iOS is riddled with hiccups!! And, when the hiccups go the wrong way they just get ejected through the other end. Wow 45 minutes that only affected a small number of users. I don't see how this is even a major issue like Michael is hinting at. I haven't noticed anything going on with iMessage for me. I'm not upset, nor is apple my favorite company. If I had a favorite company, it would be Chevy, cuz they made my beloved C-6 Corvette. 400 HP and 400 foot pounds of delicious torque at my disposal. And I mentioned google. Glad I wasn't part of that 30%. .... because the other 70% balance is your water-weight ratio?? this remind anyone of BBM?